Santafereño is the name of a soup in Colombia made up of some broth and then bits of egg, meat etc. It is more like a stew than a soup and when it comes as only the first course of three you know you’ll never reach the end of the meal. This is the ideal place for lunch if you are very very hungry and want to fill up on the cheap. But it is not gourmet food but it is definitely authentic – many people don’t even speak English and the menu is in Spanish. Eating on tables surrounded mostly by families and friends who are definitely part of the local Colombians provided colour and confidence in its authenticity – the tourists I noticed are now swelling the crowd sitting outside. 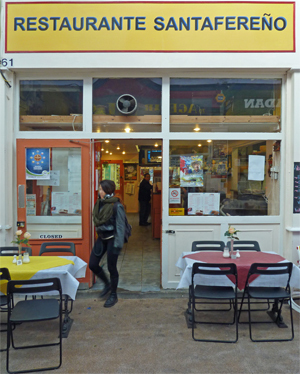 There are a couple of rooms and a spillover in the market itself and it is certainly the largest restaurant in Brixton Market with a capacity for about 40 inside and probably the same outside. The decor is basic – in fact I think the word decor is out of place. There are unmatched chairs and tables, plastic table cloths on most of them and an unfinished air about the place. This is despite this being one of the old school restaurants with a much longer history than the newer places after Brixton Village was founded. When we were perusing the menu we decided to have just a little something and we thought we had ordered a bowl of soup but what we hadn’t realised was that this was the appetiser. It was huge with a choice of various meats in it – I had pork. Then came the main course lots of meat again as well as rice and peas and a vegetable. Either course alone would have been enough to prevent most people from doing anything afterwards but doze off. We decided to deny ourselves and didn’t even attempt the pudding which was a small jelly or a flan. Our Sunday lunch meant we were unable to move for the rest of the afternoon and slothlfully walked home to digest. Restaurante Santafereño is open throughout the day and I have heard good news about the breakfast – but can anyone start the day with eggs, meat, rice, peas and plantain followed by coffee and cake. If you can it is the place for you. The service is orderly and very friendly. They showed us the fresh green salsa to eat with the main course and even tried to press us to have a taste of the pudding but we were firm. The whole three courses came to about £7.00 per person and we even had a soft drink thrown in. No wonder it always has customers. I’m sorry, you are wrong on your explanation for the name of this restaurant. “Santafereño” is a word used to denote something or someone from Bogotá (the capital of Colombia – which full name is Santafé de Bogotá), the same way the word Glaswegian is used to denote something or someone from Glasgow, or Cornish for something or someone from Cornwall; you get the idea. The soup you are referring to is called “ajiaco santafereño” and does not contain egg or meat; this is a thick soup made with chicken, a variety of potatoes and a herb called “guascas” which is what gives its distinctive flavour. This soup served as a main course is a traditional christmas/new year eve dish in Bogotá; it is garnished with cream and chopped capers and it’s usually served with boiled white rice, avocado and a chunk of corn on the cob. A smaller helping without the trimings can be served as a starter with another meal.